Juan Cabrillo Elementary is home to the Before & Afterschool program in Malibu. It offers a unique and affordable opportunity for parents to enroll students in a program located right on the campus - an easy transition for students both before and afterschool. Working parents have relied upon the program available on Minimum Days and on School Breaks for an *additional fee. The program is closed on Legal Holidays. The Before & Afterschool Program offers a professional and caring staff that provides lessons including language arts, science and cooking, art and musical experiences, daily homework time, and outdoor activities. The Juan Cabrillo program benefits from the combined experience and history of Zoe Langley and Jennifer Douglas. Students look forward to musical and theatrical productions, annual talent show, and Maypole which are presented to all students with an additional presentation for family and friends. It is not unusual for children to ask to stay at school just a little longer when they are having such a good time with their friends in the afterschool program. Before and Afterschool Kindergarten: $455. Before and Afterschool 1st  5th: $415. Fees are due monthly during the school year. Families needing financial assistance are encouraged to apply for subsidy. Hours of operation: 7:00 a.m. until school begins and then dismissal at 6:00 p.m. Program information and applications are available in the school office. 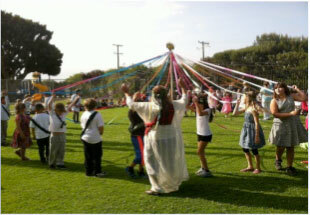 The Annual Maypole Celebration, a favorite among students and staff at Juan Cabrillo Elementary is presented by the Before & Afterschool Program. Shakespeare’s A Midsummer Night’s Dream presentation by the Before & Afterschool Program in the Juan Cabrillo Elementary School gardens.